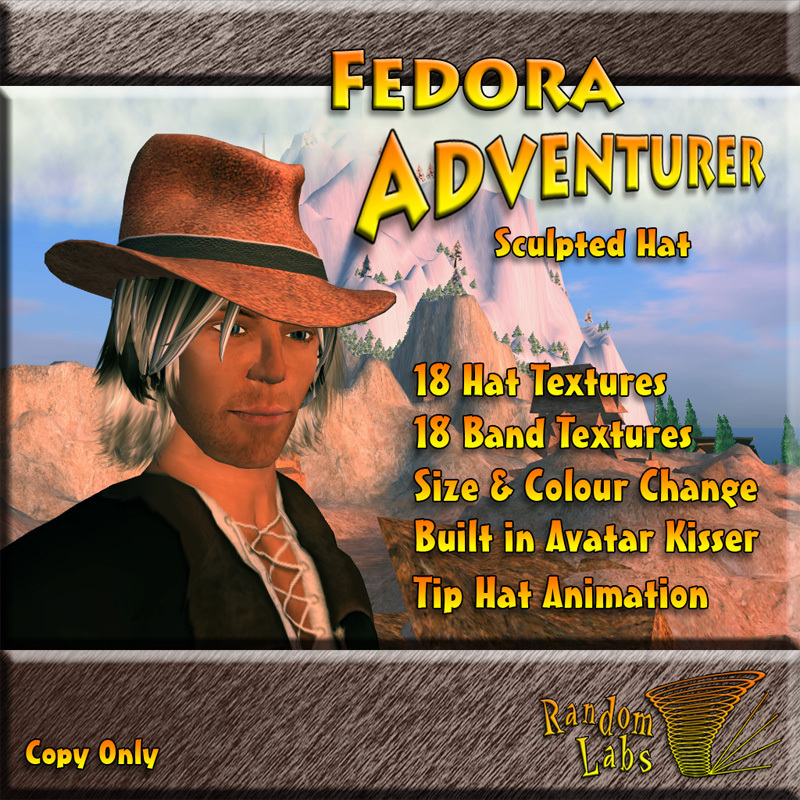 The Fedora Adventurer is a 2 prim sculpted Fedora hat controlled by a cleanly scripted menu system. You can customise its size and brightness, and select from 18 hat textures, 18 band textures and 10 bump map effects, allowing for over 2000 different styles! There is also a convenient “Set Text” option to set a floating text message above your head if needed. To access the Main Menu click the hat. Here you will find the options "Style", "Size", "Bumpiness", "Set Text", "Pose On", "Anims", "Updates" and "Exit". Most of these are fairly self explanatory so feel free to get stuck in and have a play! The menus will wait for 120 seconds for a selection before timing out. Selecting “Exit” from any menu will cleanly close the menu and stop the timer (although clicking ignore won't do the hat any harm). The style menu is where you'll likely spend the most time. The menu will list 3 styles at a time with a "More>>" and "<<More" option to access the other pages. You can quickly switch between Hat and Band styles and for your convenience it will remember your last page for each when you switch. Here you will also see a "Colour" option that allows you to change the colour for the currently selected part. Allows you to change the width, length, height and scale of your hat. Lets you choose between 10 different bump map options to alter the look of your hat. Listens for your local chat and sets what ever you type as text above your head one line at a time. Entering a period “.” will finalise the message. Once the text is set you will see a new option to “Clear Text” in the main menu. Useful if you expect to be playing with your hats style for a while. Once clicked your avatar will enter the "Editing Appearance" standing pose and the menu timer will increase to 5 minutes rather than 120 seconds, allowing you to edit its position and make other changes without worrying so much about menu time-outs. Selecting "Pose Off" or "Exit" will stop the pose animation. Select "Anims" from the main menu and then "Kiss". The hat will list the first 10 avatars it finds in a 10 meter radius. Select your preferred kissing partner and a request will be sent to them. Here you can manually check for updates and turn automatic update checking on and off. You may have noticed in some of my photos for this hat my hair appears to fit neatly underneath. This is only due to some heavy editing of my prim hair (and without the hat I have a rather nasty bald spot!). If your favourite hair is copyable and modifiable you could likely edit yours in the same way. If you'd like any tips on how to do this, please get in touch.